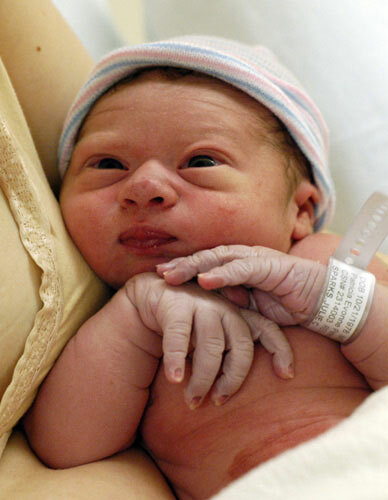 Born March 22, 2008 at 12:17 a.m. after just 7 hours of unmedicated labor. 7 lbs 2.3 oz and 20″ long. We just got home from the hospital yesterday because, true to form, we already have another persnickety palate in the house: Nolan wasn’t much interested in eating anything for the first day or two and lost 9% of his body weight. But he is starting to get the hang of how “hungry” feels, and we’re making forward progress with the assistance of a breast pump. There will be more photos of Nolan at our main blog, JcSparks.com. I’ll post again here once we’ve got our schedule a little more worked out. Good thing I didn’t put off my Daring Bakers challenge this month! Contratulations! Almost forgot how cute those little nails can be… Take care, both of you! Can’t believe I missed this! Congratulations! He is adorable…but you already know that! Thanks to everyone for the well wishes. Hard to believe this was what he looked like nearly 10 weeks ago already!